Can't get enough of us at our East Main St. location? Then take us to go! These half gallon (64 oz/ 4 pints) growlers are a perfect way to enjoy BBC beer at home or to share with friends. The glass jug itself is $4.25. To fill it is $9.50. Bring the growler back again to fill just for $9.50! It is a great deal and a perfect way to enjoy Brevard Brewing beer at home or out of town! 100% Cotton. These comfy, fashionable t-shirts come in sizes Sm- Xl in men's and in women's. 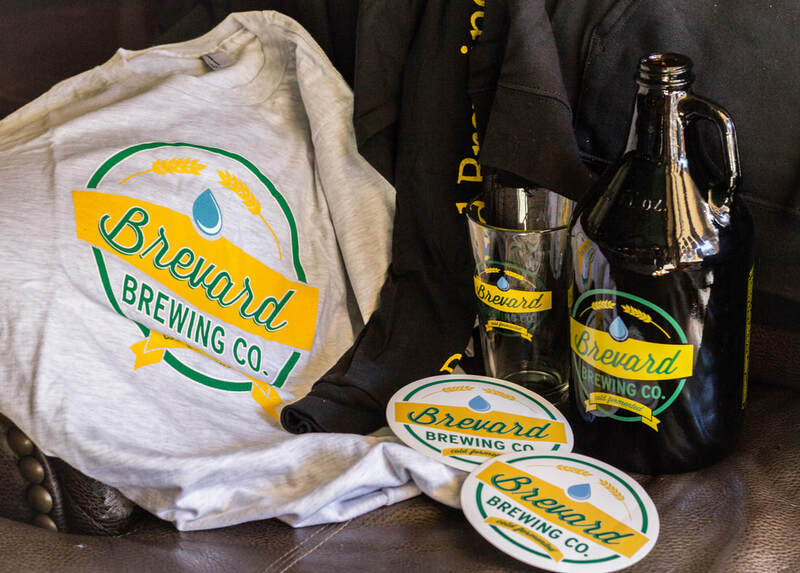 They are all in brown and come with the Brevard Brewing Company logo on the front and our slogan, 'A beer for all seasons' on the back. This is a great gift to send to family and friends from out of state or even keep for yourself! BBC t-shirts are $20.00 (tax already included in price). ​The perfect gift! And you may be thinking, 'Gift? I want one for my sipping pleasure!' Well, you can do that too. These 16 oz glasses are the same shape and size as our glasses at the BBC, but has our logo and slogan 'A beer for all seasons' on it, and can be yours for only $5.00 flat. These super comfy hoodies are a hot topic item for the cooler months. It is a zip-up hoodie with our logo on the front left top side and our slogan "A Beer for all Seasons" on the back. For $35 flat, one of these hoodies can be yours, or would be a great gift for a friend from out of town. Another great gift! These sporty BBC hats are a great way to stay protected from the sun and show your love for Brevard Brewing Company! You know what would be great? Wearing a BBC hat, sipping on our Dark Dunkel Lauger out of a BBC logo glass; keeping you warm in these cold winter months. Now that is a refreshing picture!